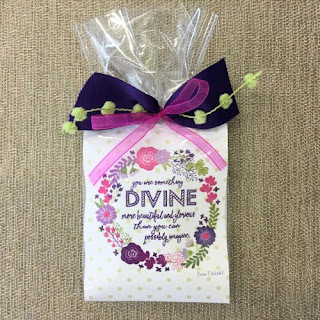 You are going to LOVE the gift we've made for you and your visiting teaching sisters this month! February's Visiting Teaching Message is titled, "Christ's Atonement is Evidence of God's Love." 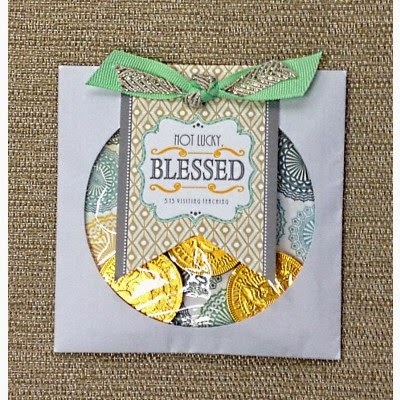 We have taken a variety of fruit & chocolate snack size pies, added the message from the Ensign, a note that says "God's Love is Sweet as Pie," and wrapped it up in a darling printed paper. 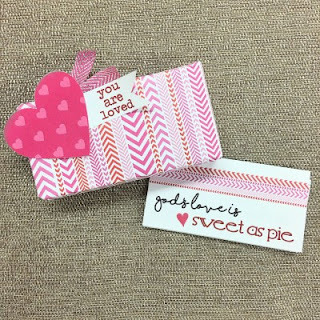 On the outside you will find a die cut heart, ribbon, and a tag that says, "You Are Loved." What a perfect reminder for all of us! Enjoy spreading love this month! 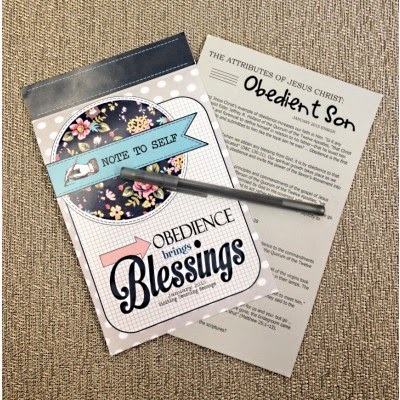 Home teaching this month includes the message from the Ensign with a tag that reads "As I have loved you, you "oat" to love one another"
April's Visiting Teaching gift is oh so springy and will brighten the day of the sisters you visit teach! The title of the message is, "Daughters of Our Eternal Father" and we have printed the entire message from the Ensign, along with an additional quote from President Dieter F. Uchtdorf - "You are Something Divine, more beautiful and glorious than you can possibly imagine." A package of Tic-Tacs is wrapped up inside with a small note reminding us that we are "mint" to feel Heavenly Father's love. The combination of purple, pink and lime green is just beautiful - we hope you love it! For April's Home Teaching gift, we have taken a miniature clear favor box, filled it with Reese's peanut butter cups, and included a copy of the message from the Ensign. The tag reads, "To REESE-eive personal revelation, do your Homework." 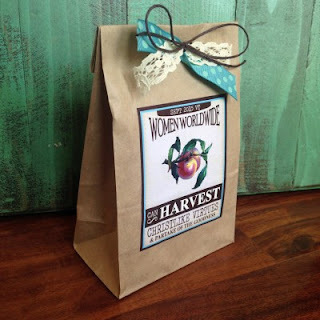 The September Visiting Teaching gift is all wrapped up in a brown paper sack with a vintage-looking label that reads, "Women Worldwide can Harvest Christlike Virtues & Partake of the Goodness." Included in the sack is a delicious and easy Peach Cobbler recipe (only 4 ingredients! 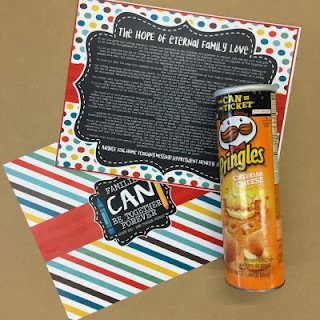 ), the full message from the Ensign, and a package (2.75 oz) of gummy Peach Rings. Your sisters will love it! Happy 20th anniversary to the Proclamation to the Family! The theme of this month's message is on prayer and how it can strengthen your family. We are encouraged to pray as a family often, and to read the Proclamation once more this month. It's all about being patriotic with this month's visiting teaching gift. We've taken a bandana (red/blue assorted), and wrapped up the message from the Ensign, a package of Twizzlers, and a cute "10 Ways to Use a Bandana" handout! 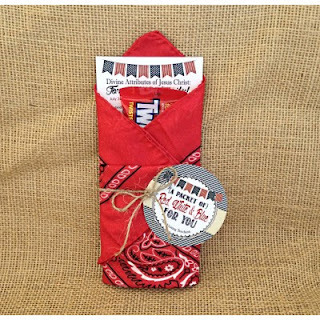 Jute twine ties it all together with a tag that reads, "A Packet of Red, White, and Blue For You." You can always add a personalized note and tuck it in with the other handouts to personalize. The home teaching message in July is entitled, "All is Well," and written by President Dieter F. Uchtdorf. We have created a 5"x7" print (that looks great in a frame for a July home decoration) that reads, "All is Well, All is Well" (quoting the popular Pioneer Song "Come, Come, Ye Saints" - Hymn no 30). The full message from the Ensign, as well as a gourmet package of nuts & chocolate is also included. 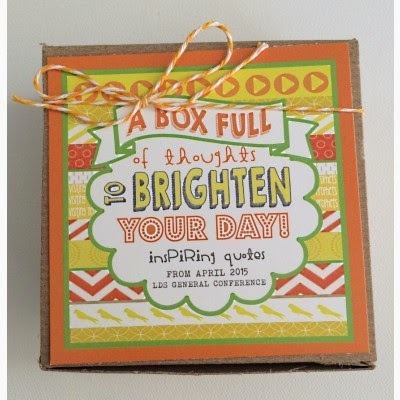 Our May Visiting Teaching Gift is so bright and cheery - you're going to want one for yourself! 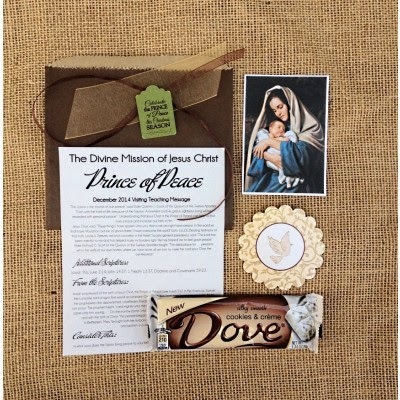 Each quote card measures approximately 3.5" x 3.5" and the box measures 4"x 4" x 2"
Our home teaching gift this month is a handout with multiple quotes from the LDS April 2015 General Conference... wrapped around a box of microwave popcorn (includes 3 packets of popcorn). Perfect for a couple or family to munch while they review some of the great teachings from conference. Buy online here or in store.